Looking for a way to get more trust in your brand, a lift in consumer engagement, and an edge over your closest competition? The path toward all those goals may start behind the door with the “CEO” name plate on it. A dramatic number of consumers have come to expect an executive presence on social media, particularly Twitter, as a means of accessing brands 24/7/365. To be fully effective, this presence will be separate from any marketing content but consistent with the message it contains. For marketers, this means it’s time to drag your CEOs into Twitter Town, if they aren’t already there. We’ll dive into the many benefits of executive involvement in social media, then give you seven Tweet Templates to give your executives a road map if social networks are uncharted territory for them. A recent survey by BrandFog revealed that when executives are active on social media, consumers develop a higher level of confidence in the company’s leadership. Executives who are active on social media convey that they are invested in the companies that they run. Even if they’re secretly planning to jump ship, they appear committed, and the company appears more stable. This baseline of involvement becomes even more vital in times of crisis, when consumers and competitors alike will often look to executives to see how to respond to difficulties. If executives post for the first time after their database has been hacked or there’s been a fire at their warehouse, any words of reassurance will ring hollow. If, however, they have an established, trusted social media persona, their commentary will seem far less biased and far more trustworthy. Of course we hope that crisis management is one thing a CEO’s social media account is never used for, but there’s no way to create the presence in the moment of need. It has to be pre-established to be available in a company’s moment of need. A positive initial association and crisis management aren’t the only benefit of a tweeting CEO, however. Consumers routinely go beyond high-level brand awareness and become more likely to make a purchase from a company with socially active executives. The same BrandFog study found the brand awareness established by executive visibility “builds greater trust, brand loyalty, and purchase intent.” When faced with the choice between a brand whose activities are front and center and whose messages are presented consistently and another brand that’s maintaining relative radio silence, consumers will nearly always pick the brand they know more about. In a B2B situation, this becomes even more important. Businesses will be looking at every potential point of communication to make sure that the leaders they’re signing on with have things well under control and will be around to maintain the partnership for the long term. There are lots of options for executive engagement on social media, but Twitter is a low-risk way to get started that also has a low entrance threshold. You can grab a Twitter handle and start tweeting in a matter of minutes; there’s no potentially paralyzing need to fill out a full profile that you can encounter on LinkedIn or Facebook. Because handles come so easily, Twitter is also an easy place for executives to create a professional persona that they can differentiate from their personal social profiles. Even if they already have a personal Twitter handle, they can grab a branded version and not worry about overwhelming personal connections with corporate content. Finally, the instant gratification of Twitter can give hesitant executives the quick wins they need to get fully on board with a project like this. When they join a chat and get fifty new followers in an hour, they get a sense of accomplishment that takes a lot longer to achieve on Facebook or LinkedIn. With all that said, however, if you encounter a lot of resistance to Twitter, you can start on another network first. You can also check out MarketerGizmo’s Tweet This, Not That guide that may help you argue the benefits of Twitter for businesses. 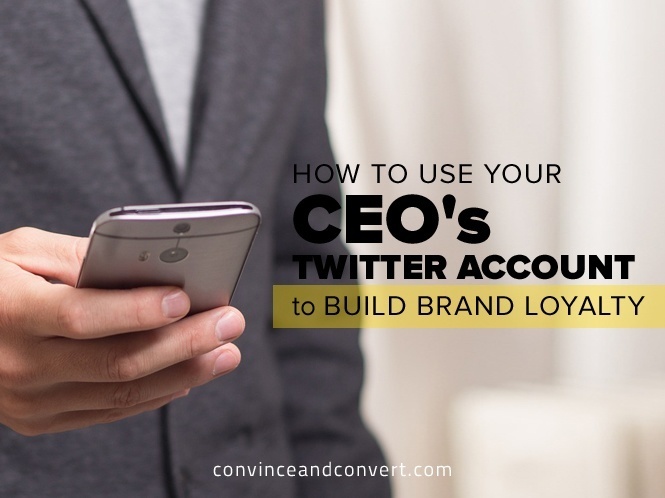 So, the benefits are clear, and you want your CEO on twitter. But what you don’t want are executives who create more problems than they solve with wildly off-message retweets or inappropriate shared links. To keep them on track (and out of your hair), give them these seven tweet templates they can rotate in and out. If they use one of these once per day during the week, these templates can represent two weeks’ worth of original tweets. I recommend also including a list of appropriate hashtags that are relevant to your industry, product, and brand and offer explicit guidelines on how many they should use in each tweet. Have a rabid content consumer in your C-suite? Have them tweet the contents of their bookshelf or RSS feed. Approximately 100 characters on an exciting, fun, or out of the ordinary office event. These should include @companyname and/or #companykeyword every time. These should be an authentic, in-the-moment back-and-forth with a follower, other executive, or thought leader in response to something they post or a current event. A good guide is to make them read like a text message, and to remind your executive that these conversations can extend over multiple tweets. These are an easy way to show your company’s involvement in your industry. Simply mentioning an event, twitter chat, conference, or other relevant happening that involves executives or employees works great. Don’t forget to include the appropriate hashtag and handles. Stumped for content to fill out your Twitter feed? Quotes can be great if not overused, particularly if your executives can mix their personal interests in with more business-centered topics for authenticity . Keep these to a minimum, but don’t be afraid to talk about your product. It’s not called social media marketing for nothing. Use sparingly so as not to overwhelm your followers. Images can look great in a Twitter feed, but overusing them may get you unfollowed or muted. As far as content, these can fall into many of the other Tweet Types (office culture, quote, event shout out, etc.). A good Twitter feed isn’t all about the person who owns it. Make sure you’re following the rules of being a good social citizen by sharing other people’s content more than your own. The easiest way to do this is to retweet liberally and often. Thank people who retweet and follow your executive accounts too. Some CEOs may do better if someone else does this part for them, so a shared social media scheduling software like Buffer or Hootsuite may be required. You can also setup notifications to your social media marketing team when someone follows, mentions, retweets, or favorites something on an executive Twitter account, if you need some focused follow ups and can’t rely on your executives to do it. Pairing up reluctant executives with experienced Twitter users is a great way to kickstart their presence on the network, and you can extend this system out to other networks as well. The Altimeter report that produced the Cisco example above rightly emphasizes the need to keep executive involvement on social media focused on business goals and objectives. You also need to ensure your mentors structure their training around the brand awareness, loyalty, and positioning that each tweet helps produce.